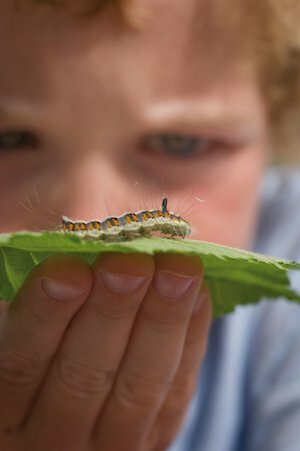 The ‘great outdoors’ offers children an inspiring environment teeming with ready-made resources – from buzzing bees to towering trees. Whatever your school’s outside space, there is great opportunity for cross-curricular learning outdoors. This topic invites children to take ownership of a section of their school grounds to encourage wildlife. As well as the expected links to science and geography, learning links are also made with D&T and literacy, and PSHE with the various opportunities for teamwork. 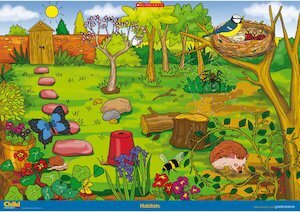 Don’t forget to access the accompanying online resources that include a Poster and Activity sheets, as well as an exciting Interactive resource , ‘Find the habitats’ that features sound effects, videos and pop-up facts. to access the resources that accompany this topic, including the Poster , ‘Habitats’ and Interactive resource , ‘Find the habitats’. There are also lots of activity sheets – scroll down to the bottom of the page to view them. 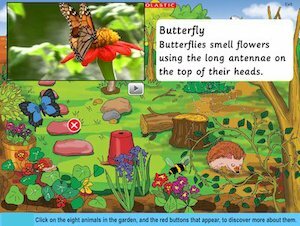 The Interactive resource , ‘Find the habitats’ invites children to locate eight creatures within a garden scene. When clicked on each animal, be it a slug, butterfly or hedgehog, moves before a fact and video is revealed. Where do different animals live? I hope you find these Key Stage 1 links helpful.